I have just returned from a a couple of weeks in the Caribbean, it was a bit of a shock to leave the sunshine and daily temperature of 28 degrees and arrive back to the cold and the snow. It would appear that despite the major problems a couple of weeks ago, local practices coped well despite the atrocious conditions. I would have expected nothing less from our practices, in that they would strive hard everyday to provide high quality care to their patients. This level of commitment and dedication can be taken for granted by Governments and patients alike, but should be valued as this is what forms the foundation of our healthcare system. Essentially no news but we should know the outcome of contract negotiations and the DDRB recommendations shortly and in addition details of the Indemnity reimbursement scheme for 2017/8 have been published. The LMC would encourage Practices to provide this information. New national guidance on prescribing responsibilities between primary and secondary care has been published on the NHS England website and is also attached. An update on the action the BMA is taking on behalf of the profession. Many GPs are seeing an increasing number of patients asking for PSA screening despite this not being a national programme. This has been caused by greater media coverage caused by a number of high profile celebrities who have been diagnosed with the condition resulting in greater public awareness. It is a sign of the profession taking its own mental health seriously that the LMC held such a successful Mental Health Conference recently and I am pleased to be able to support this national event. Recent evidence suggests that despite the increased number of GPs in training this is not being seen as a conversion into total number of GPs. Over the years GP Training has increasingly focused on getting through the Applied Knowledge Test (AKT) and the Clinical Skills Assessment (CSA) and there is not enough about the the wider aspects of general practice including the important aspects of leadership, practice management, contracts etc. The LMC sees the relationship between ourselves and our future workforce as an essential one and is looking to strengthen and develop this. It is becoming increasingly common to see Pharmacists working as part of the Practice Team. General Practice receives slightly less than 8% of the total budget and the medication prescribed by GPs costs the NHS about 8% of the total NHS Budget ( about £8.5 billion). People who are residents in care homes will generally be prescribed more medications than the general population. In my Practice as part of the Vanguard we have a funded Pharmacist based in the Practice who works as part of the team and aims to help with quality prescribing which has included reviewing and often reducing the medication in people who are in care homes and this is seen to have both clinical benefit as well as reducing drug costs. A good example where better outcomes can be delivered but these need to be funded rather than just expecting general practice to pick up the additional work without adequate resource. Over the last couple of weeks I have received a number of emails asking about when Practices can expect any guidance about potential changes to the GP contract for 2018/9 and also potential pay rises for staff for next year. In a previous email I detailed the contents of the presentation provided by the GPC at the local Roadshow. Essentially the potential changes were quite small. We have been told previously that the BMA has for the first time for a number of years gone to the DDRB to seek an increase in pay of more than 1% (which was the previous Public Sector pay cap). The DDRB is expected to publish its recommendations shortly and then it will be up to the Government to decide whether it will honour these recommendations. Financial planning for next year will be based on the outcome of contract negotiations and the recommendations of the DDRB which should be known shortly. NHS England have agreed a non-recurrent payment of £60 million to be paid to GP practices based on unweighted patient numbers, to cover the increased costs of indemnity inflation experienced in 2017/18. These payments are being actioned centrally to be paid in March 2018 and will start to be received in practice bank accounts shortly. This is the second year of the two year arrangement announced in the GP Indemnity Review from 2016 (available at: https://www.england.nhs.uk/wp-content/uploads/2016/07/gp-indemnity-rev-summary.pdf) and follows on from the £30m paid towards indemnity costs in March 2017. This is to cover indemnity inflation experienced in 2017/18. A sum of money will be paid to practices and the agreement is that this will be shared between the Partners and Sessional GPs on the basis of the number of sessions worked over the course of the year. The exception to this will be the Practices who pay for their sessional GPs Indemnity costs. Locums are not covered in this payment. Essentially for GPs who are continuing to work the same number of sessions the payment will be twice what it was last year. I was concerned to hear last year that some practices kept the whole amount and did not share this with their Sessional GPs. As far as I am aware none of these practices were in Wessex. The next regular extraction of practice workforce data will take place on 31 March. Practices have already been informed of this by NHS Digital, and a copy of the letter is attached. This is important information that helps the GPC to highlight and respond to the recruitment and retention crisis impacting general practice. The LMC would encourage all practices to take part so the GPC has as accurate a picture as possible. This important piece of work sets out the principles that should be applied in ensuring proper governance and patient safety. It came from the GPC's ‘Primary and Secondary Care Interface Working Group’, which is working to drive forward actions intended to improve processes and collaboration across the primary and secondary care interface, and is in response to a commitment made in the General Practice Forward View. The BMA is taking the issues relating to Dr Bawa Garba’s case very seriously. This week discussions took place at both BMA Council and GPC UK meetings about the wider implications. This follows LMCs declaring a vote of no confidence in the General Medical Council at last week’s LMC conference . The motion passed by the conference has been sent to all branches of practice in the BMA as this is a pan-professional issue and it is important that the BMA provides consistent advice to all doctors. The BMA has now had a number of meetings with the GMC to address some of these fundamental issues and will be running a number of relevant events, including a summit on system pressures and patient safety, a work programme and event on racial bias, and a major pan-professional survey to provide a comprehensive picture of the impact of system pressures on doctors. The BMA’s Medico Legal Committee (MLC) has been leading on a project looking at the growing number of doctors being prosecuted for gross negligence manslaughter. In addition, the BMA will be contributing to two external reviews of gross negligence manslaughter relating to healthcare – one led by the GMC and one led by the Department of Health and Social Care. I have recently been contacted by Dr Matt Hayes, Consultant Urologist at University Hospital Southampton and Clinical Director, of the Wessex Cancer Clinical Network and Dr Nicola Robinson, GP in Southampton and Macmillan GP Advisor Wessex (Dorset, Hampshire & Channel Islands) providing me with some updated information which I have been asked to share with you. GPs have seen a surge in requests for men requesting PSAs following the recent media coverage of celebrities affected by prostate cancer. There has been no change in the UK National Screening Committee in regards to population screening, but individuals may seek a PSA test at the practice. The following links provides a two sided information sheet to help support GPs and for individuals over 50 . In Wessex we recently arranged a mental health day which proved to be very successful. This event covered how we can look after our own mental health and wellbeing as well as where help is available via the NHS Practitioner Health Programme. I am pleased to share details of a national event which will take place on Thursday 4 October 2018 — Friday 5 October. 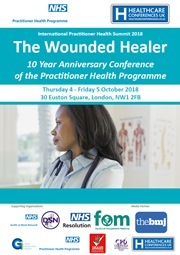 Aimed at doctors, nurses, pharmacists, allied health practitioners, dentists, counsellors and researchers in the field of practitioner health the 10 Year Anniversary Conference of the NHS Practitioner Health Programme will bring together the academic, clinical and experiential aspects of physician and practitioner health with a particular focus on mental health. Wessex LMCs represent all GPs and this includes partners, sessional GPs and importantly GP Trainees as they represent the future of the workforce, and it’s important to enable them to engage with the activities of LMCs. Each of the three LMC Committees in Wessex has a place for a GP Trainee. The Royal College of GP's Associates in Training (AiT) Committee Chair this year is Dr Sophie Lanaghan who is a Wessex Trainee, I have met with her and offered her the LMC's support. In my recent emails I have provided details of the support the LMC has provided to the "Next Generation GP" initiative. These are 65 of the youngest and brightest emerging GP future leaders in Wessex. The LMC has bid for national funding to provide a couple of leadership roles within the LMC's structure, details are being discussed at present. The LMC regularly attend the various Day Release Courses in Wessex to engage with the GP Trainees, informing them of the role of the LMC and also to discuss the role of general practice in the ever changing world of the NHS. The BMA's GP Trainee subcommittee has produced guidance on how GP trainees and LMCs can work together effectively. Wessex LMCs contributed to this report and you will see a number of comments made by Dr Sarah Kay, a GP Trainee in Dorset and a member of Dorset LMC. The report is attached to this email. The LMC works closely with Health Education England (HEE) and Wessex Deanery, both have agreed that GP Trainees attending an LMC Committee meeting is an important educational experience. If you are a GP Trainee or a Trainer reading this and want to take up this offer please email: lisa.taylor@wessexlmcs.org.uk. Here is the link for the quarterly GP trainee newsletter - click here . NHS England have announced plans to recruit and deploy hundreds of pharmacists into care homes to help reduce overmedication and cut unnecessary hospital stays. The GPC is represented on the NHS England-led national working group for the implementation of clinical pharmacists in General Practice, the GPC will therefore will be influencing how practice based pharmacists will interact with pharmacists and pharmacy technicians in care homes. Many local medical committees are still struggling to get sessional GPs involved in their work. We are working to ensure you know the benefits of engaging with yours. For the latest newsletter click here . Wessex LMCs gets very good engagement from Sessional GPs. Two of the LMC's Medical Directors are Sessional GPs and on each LMC Committee there is a balance of Partners and Sessional GPs. The scheme is due to end on 2 April 2018 and the GPC are concerned that the ending of the scheme will have a great impact on OOH and unscheduled services and in turn,increase pressures on general practice even further, we raised the issue with NHS England this week. Please help the GPC to assess the scale of the impact by completing their short survey - click here . As I am sure everyone knows the GDPR will replace the Data Protection Act later this year. I personally hear lots of people express their opinion about what the introduction of the GPDR will mean, some of which I believe to be true, some of which is definitely not true, but as yet it is less than clear. The LMC is working closely with the national and local experts to provide a series of Webinars which have been advertised recently.